What is this “d-mac” device? The only current page I found for this device is this Chinese one, which didn't clarify anything. It looks like she's digitizing a blueprint. 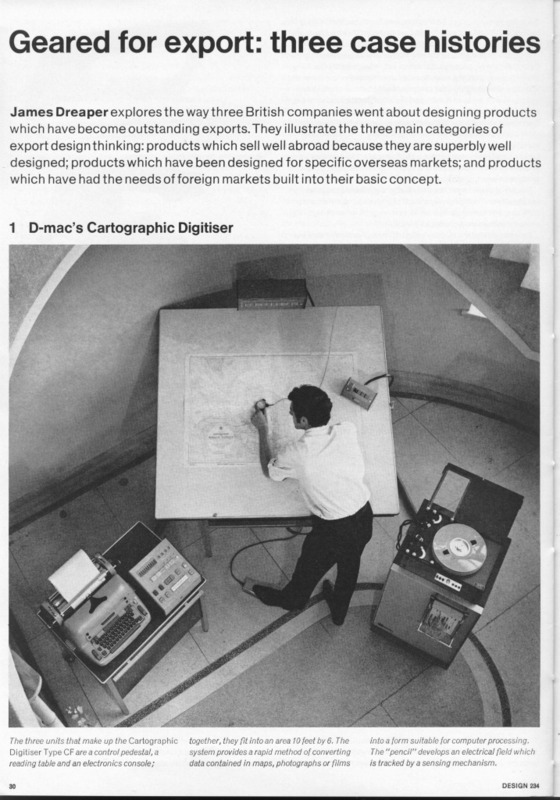 Both devices appear to be early types of graphics tablet. I was a design engineer with Dobbie McInnes ending up as Chief Engineer for Digitising Systems at Ferranti Infographics, so I can comment on these pictures. 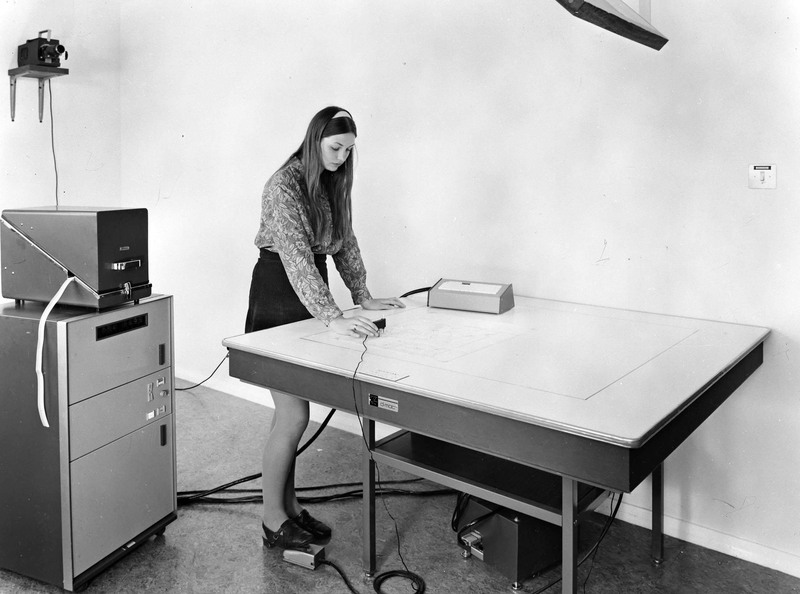 The centre picture is of a mid 1960s CF digitiser, using the Pencil Follower table developed by Dr Boyle under contract to the Canadian Geographical Information System project. 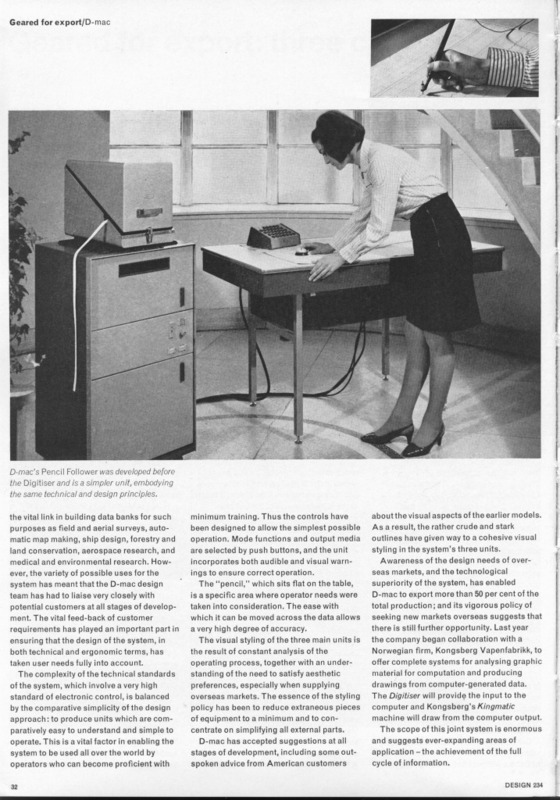 The control cabinet on the right has a patch panel on the front to fix the format of the data output - the unit on the top is an incremental magnetic tape recorder - a hard disc output was never used directly. There were apparently many varieties made but this was because each one was a "special". The top and bottom pictures are late 1960s System 1 digitisers, manufactured with discrete transistors etc. These digitisers were more standardised so their appearance is similar, although many individual customisations were made. The item on the top of both of these is a BRPE high-speed paper tape punch (110 chars/sec) which despite being in a soundproofing case made an appalling noise when running. The box under the table in the upper picture is the Servo Power supply, not usually placed on the floor but inside the cabinet. This is also an interesting picture as there's a projector on the wall and a large mirror above the table to allow slides to be digitised. The middle and bottom pictures were taken in the foyer of D-Mac's factory in Hillington Glasgow. I remember it well! If you want further information on these and later systems or the companies involved, please ask. Not the answer you're looking for? Browse other questions tagged 1960s 1970s computers or ask your own question. Harvard Architecture: How did Harvard Mark I separate data and instruction? Is the position of women as portrayed in the Mad Men series historically accurate? What happened in Calcutta in 1961? What was this security screening process in Swiss airports, circa 1970? Is this 60's Atlanta airport security picture geniuine, and if so, what is happening here?